Security Memetics: What's next, the Caesar cipher? 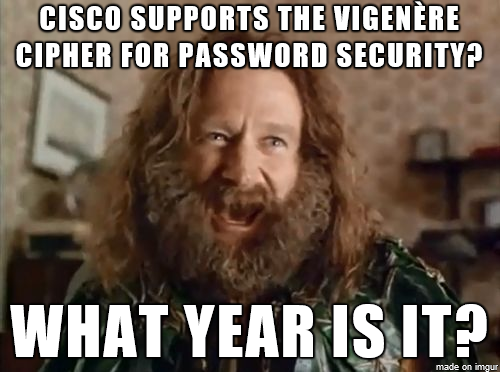 Cisco may discourage it's use, but for a cipher that was broken in 1863 it's hard to understand why it would be in modern equipment, or even legacy equipment at all. At some point backwards compatibility just becomes plain backwards. Thanks to Liam O for tweeting about this ridiculous state of affairs.